The new 2019 Ford Ranger has returned to the American market with a more conservative re-introduction. At the base is the XL, starting around $24,000, the XLT occupies the middle shelf starting just under $28,000, and the top-level Lariat starts at around $32,000. Across the board, they all have a maximum tow capacity of 7500 (500 more than its Chevrolet counterpart, the base V-6 Colorado), and come with the same 2.3 Ecoboost engine and 10-speed automatic transmission. The Ecoboost engine is quite impressive; equipped with a twin-scroll turbocharger, it cranks out 270 horsepower and 310 lb. feet of torque. 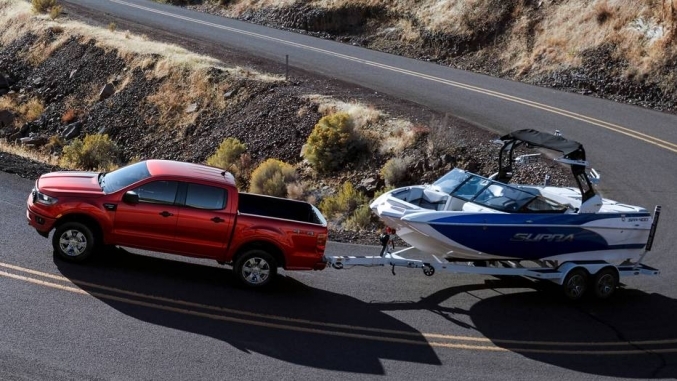 The precise model we tested, as we thought it would be the most beneficial for the average, budget-minded weekend racer, is the 2019 Ford Ranger XL Super Crew 2WD with the Trailer Tow Package. The MSRP comes in at just over $29,000; not bad at all in today’s money, and right on par with competing offerings by Chevy, GMC, and Toyota. A comparably spec’d 2019 V-6 Colorado 2WD Crew Cab Short Box comes in right around the same number, albeit with less torque and 500 pounds less tow capacity. When driving around town, power is essentially always available and turbo lag is nearly impossible to detect. Though, when planting the gas pedal, there was a pretty substantial lag in the transmission to determine which of its 10 gears would be the most appropriate. However, once a gear was selected and engaged, the athletic, lean 4,300 lb. truck took off nicely. Acceleration was more than ample for a truck in this class. The upside to this vast array of gears is good highway fuel mileage and making the most of its large torque band; queue the semi-truck and C.W. McCall analogies… though a gaggle of trucks towing Spec Miatas isn’t exactly a great big convoy. While we didn’t have enough time to burn through a tank of fuel, the Ranger seemed like it would have no issue achieving the EPA rating of 23 miles per gallon in mixed driving. This is due largely in part to its transmission and standard auto start-stop, which was probably the nicest auto start-stop we’ve ever tested. To nobody’s surprise, the engine didn’t have a particularly nice tone to it, though is that really a concern for someone who needs a modestly-priced weekend tow rig that could double as a reasonable daily? Speaking of daily-driver potential, the Ford Ranger would be a great daily truck thanks primarily to its handling and suspension. The ride was more lifted Volkswagen GTI than lumbering truck; turn in and cornering under daily and slightly-spirited circumstances were very good. The Ranger didn’t bounce around and porpoise over undulations in the road like many trucks just a hair bigger than it. It feels like Ford put a lot of thought into the suspension and it shows; with double A-arm front suspension and intuitive rear 2-stage parabolic leaf springs, the ride was very composed yet also compliant. Turn in was also sharp: take an average 90-degree right-turn down a suburban street at 20 miles an hour and there is virtually no body roll. Combine this sharpness with great visibility and an 85-inch width, and this would make for a great truck to weave through traffic, spend lots of time on the highway in, etc. Because of its more compact dimensions over Full-Size pickups, it’s much easier to live with day-to-day as well, particularly if you find yourself having to parallel park frequently, leave it in parking structures, etc. Steering, while very numb, was very light and easy. This would really come in handy for hooking up a trailer or wielding a venti coffee while steering with ease. The absolute-most-base Ford Ranger XL money can buy is very sparsely appointed, without normal modern features like cruise control. Luckily, tacking on even the most inexpensive of packages solves that issue (though one has got to give Ford props for doing everything they can to sell a truck for as cheap as possible). Moving up from there the interior and command system are very nice. Equipped with Ford’s Sync system to handle Bluetooth, the stereo, and even 4G LTE connectivity, the controls are mercifully push-able buttons, not annoying touch screens. There are some really nice technology features available in the higher trims, such as lane keeping, adaptive cruise control, and even Blis™, which is a system that not only alerts the driver of another vehicle in their blind spot but also if there is one alongside their trailer. This is incredibly valuable for anyone who is stuck in traffic on the highway after a tiring weekend of racing. Another technology benefit that comes standard across all trims, is a rear-view camera with a line indicating where your hitch is; it’s the simple things that count. The seats for the XL level that we tested come in either ebony cloth or dark vinyl and are comfortable with good adjustment. The top-level Lariat comes with leather-trimmed seats, with heated front seats; though the base MSRP on the Lariat Crew Cab 2WD starts at over $35,000. All of the interior panels and trim pieces are on par with other modern Fords; above average and nice to touch. The seating position was good as well, though the seats could potentially become uncomfortable for longer hauls. The headroom was absolutely massive and has plenty of space for folks over 6’5”. Tall guys rejoice! Seat room up front is just as ample and despite its more compact width, there’s plenty of room for 2 tall adults in the front seats. The backseats, not so much. We mentioned earlier that the handling was more GTI than lumbering truck: so is its rear seat room. It isn’t bad, just not the best for adults over an extended period of time. 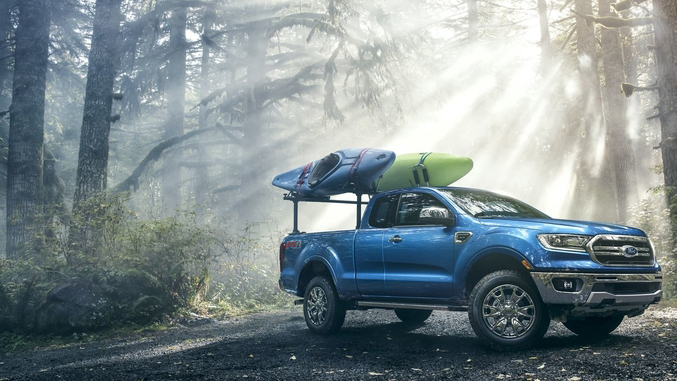 The 2019 Ford Ranger, no matter what level of amenities consumers decide is best for them, is an excellent value and has a ton of potential. There are enough trims and packages available for Ford to cast a wide net and pull in a bigger market share, but not enough to become confusing and unnecessary. Good power, great amenities, excellent tow capacity, good fuel economy, nice looks; there’s not a whole lot to dislike about the Ranger. It’s nicely equipped as a base work truck, capable off-roader, or dependable tow rig. And with prices giving similarly spec’d Chevy Colorados a run for their money, it’ll be interesting to see how sales pan out. Perhaps Ford will not only be on pole in the Full-Size field but also in the Mid-Size field. Currently, the only engine available is the 2.3 Ecoboost, but we’re willing to bet green money that a more powerful V-6 will be here sooner than later. It’s their first year back in this segment after an 8-year hiatus; so long as sales go well, this truck is sure to get better and better. Speaking of V-6 power: wouldn’t it be wonderful if they dropped the current-gen Ford Raptor’s twin-turbo V-6 under the hood of the Ranger in the near future? We’d sure get a kick out of a smaller, more agile Raptor, with a massive-grin-inducing power-to-weight ratio.